Keep hands clean by thorough and frequent washing with soap. Alternatively use a hand sanitizer spray or liquid dispenser. Pharmacies stock these in convenient pocket or handbag sizes. Minimise the risk of infection by keeping a distance i.e. minimum of 6ft from those with cold and flu symptoms or use a face mask. Take Vitamin C. Recent research shows that Vitamin C has significant anti viral properties. This is where Beeline plays an important role. Reach for Beeline when Colds and Flu threaten. Vitamin C cannot be stored in the body for any length of time. It is an immune booster which can reduce the risk of catching a cold or flu virus. Beeline’s best selling Vitamin C + Zinc effervescent tablet makes an easy to take, orange flavour drink with double action Vitamin C + Zinc properties. Each glass contains the equivalent of 20 pressed oranges, with 1000mg of Vitamin C, helping to replace Vitamin C lost through cold and flu and to speed recovery through supporting the immune system, with Zinc 15mg to help to combat cold and flu and speed up the healing of infections. Available from our Vitamin range is our Vitamin C effervescent tablet which makes a sparkling drink providing 500mg of Vitamin C - the ideal way to replace Vitamin C lost through colds and flu. Taken daily this is fast acting once it reaches your digestive system and is 100% available to your body, not only that, it’s made from gluten free ingredients and is suitable for vegetarians. Also available is Vitamn C 550mg & Zinc 10mg Time Release Tablets. This is a breakthrough formula as it utilises Sustained Release technology which ensures the gradual release of nutrients throughout the day. 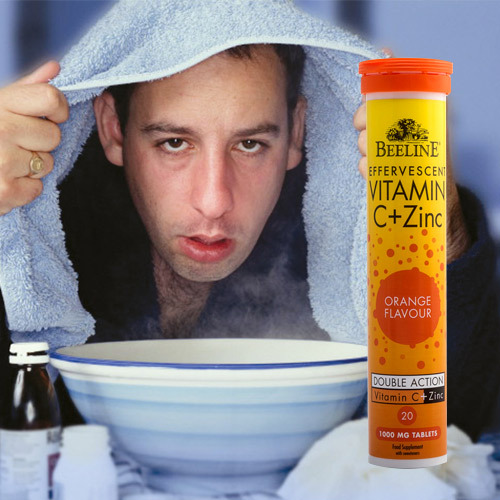 If you’re already feeling a little under the weather try Beeline Elderflower + Vitamin C + Zinc effervescent tablets. Elderflower is an under rated supplement. It is very much an ingredient in traditional medicines worldwide due to its antiseptic and anti-inflammatory properties and is most commonly used for colds and flu. One a day makes a lovely citrus flavoured, sparkling drink. It’s triple action formula helps reduce the duration and severity of colds and flu - a great way to boost your immune system.